Veterans Affairs Secretary Eric Shinseki testifies at a Senate Budget committee hearing. Veterans Affairs Secretary Eric Shinseki is expected to come under sharp questioning at a Senate panel today about case backlogs handled by his department, including reports that veterans have died while awaiting treatment. Among Shinseki’s critics is the head of the American Legion, Daniel Dellinger, who last week called for his resignation. Veterans of the post-9/11 wars are among those who give the VA low marks. A survey conducted Aug. 1 – Dec.15 last year by the Washington Post and Kaiser Family Foundation of soldiers who had served in Iraq or Afghanistan found that 58% rated the job the VA was doing to meet the needs of veterans as only fair or poor, while just 38% graded it excellent or good. Asked whether the VA put enough focus on post-9/11 war veterans compared with its treatment of previous generations of veterans, half of those who served in Iraq or Afghanistan said the treatment they got was about the right amount while 44% said it was not enough. A significant share of Iraq and Afghanistan veterans came away from the wars saying they were in worse shape than before they entered the service, according to the Post/Kaiser survey. About four-in-ten (43%) said their physical health was worse after finishing their tours, while 31% said their emotional and mental health was worse. The veterans agency fared somewhat better in an extensive survey of post-9/11 veterans conducted in 2011 by the Pew Research Center. 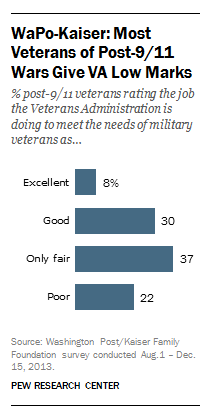 About half (51%) said the VA was doing an excellent or good job in meeting the needs of military veterans (with 12% rating it excellent) while 44% rated it only fair or poor. However, combat veterans who had traumatic experiences during their service or who have suffered from post-traumatic stress (PTS) were more critical of the VA, with 56% saying the agency was doing only a fair or poor job compared with 43% who rated it as excellent or good.